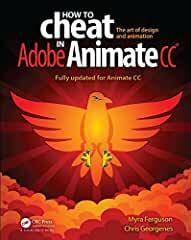 How to Cheat in Adobe Animate CC is a goldmine of artistic inspiration, time-saving practical tips, and step-by-step walkthroughs. Let your sasquatch sunbathe, your coyote howl, and your lint spider see the light of day. With real-world projects and project source files, you can follow along and try for yourself. This book includes all NEW content and cheats for Animate CC, such as making cinemagraphs, creating a double exposure effect, speeding up the process of making real life doodles, simulating a bokeh effect, converting your documents to HTML5, and more. • Glimpse into the workflow of digital media and animation experts and apply practical techniques and tips to your own projects with source files, examples, and tutorials. • Learn a myriad of tricks based on real-life working methods to help you work faster and more efficiently with new features in Adobe Animate CC and the Creative Cloud. • Work from the problem to the solution to gain the best possible results from Animate.